We had an outstanding time cooking, even though it was blazing hot and being on an asphalt parking lot did not help. Jack, the team captain, is a seasoned Memphis in May cook, winning numerous awards. Pork 17th. Again, no sauce. The most important thing is that we had fun cooking and hanging out. With a bit more practice, we will do better in the future for sure. This is so cool Bill. Must have been a great experience. Love the pics also. Do they do something like this on Guam? It was a great time, Bill. Awesome job on the chicken! 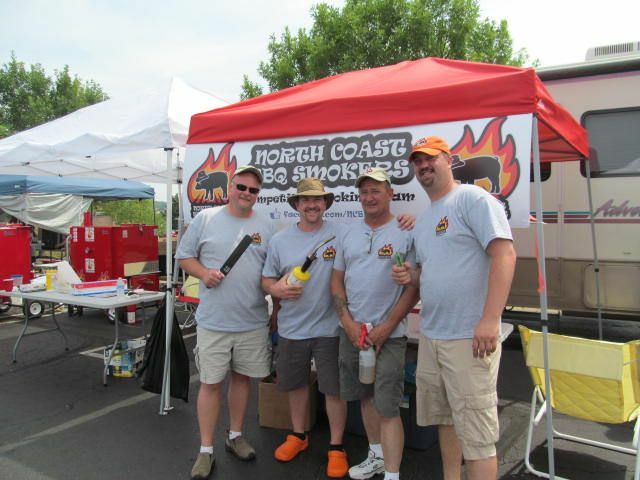 I learned some valuable lessons about cooking in KCBS. I'll definitely use sauce next time. Those Memphis style ribs didn't please the judges, but they were damn good to eat! Thanks Jack. The ribs rocked. I'd eat them anytime. We'll definitely have to do this again! Bill, every year there are numerous grilling competitions here on Guam. The biggest drawing about 21 teams but the prize money is usually about $10-$15,000 due to our sponsors. But that comp is maybe every 4-5 years. Most of our annual comps are 5-10 teams and smaller prizes. But you know how comps go, great fun, people and food. Can't lose!! !